Roger Daltrey is an English singer, best known as the founder and lead singer of English rock band The Who. The Who’s hit songs include “I Can’t Explain”, “My Generation”, “Substitute”, “Pictures of Lily”, “Pinball Wizard”, “I’m a Boy”, “Happy Jack”, “Won’t Get Fooled Again”, and “You Better You Bet”. In addition to The Who, Daltrey has released eight solo albums. His solo hit singles include “Giving It All Away”, “Without Your Love”, “Walking in My Sleep”, “Walking the Dog”, “Written on the Wind”, “Free Me”, “After the Fire”, and “Under a Raging Moon”. He has also worked as an actor in the theatre, on television and in films. 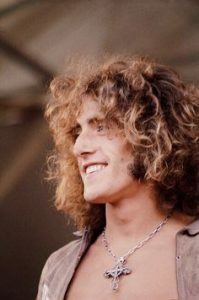 Born Roger Harry Daltrey on March 1, 1944 in Hammersmith, London, England, UK, to Irene and Harry Daltrey, he has two sisters, Gillian and Carol. He was educated at Victoria Primary School and Acton County Grammar School. Daltrey made his first guitar from a block of wood, a cherry red Stratocaster replica, and joined a skiffle band, the Detours. He has been married to Heather Daltrey since July 19, 1971. He was previously married to Jacqueline (Jackie) Rickman. He has two daughters named Willow and Rosie and three sons named Mathias, Simon, and Jamie. *He was born on March 1, 1944 in Hammersmith, London, England, UK. *The founder and lead vocalist of the legendary rock band The Who. *He was a sheet-metal worker before becoming a member of The Who. *He plays the flute, tambourine, harmonica, and guitar. *As a member of the Who, Daltrey was inducted into both the Rock and Roll Hall of Fame in Cleveland and the UK Music Hall of Fame. *He was awarded the Commander of the order of the British Empire (C.B.E.) in the 2005 Queen’s New Year’s List for his services to music and charity. *He was ranked as number 61 on Rolling Stone’s list of the 100 greatest singers of all time in 2010. *He was ranked #53 on VH1’s 100 Sexiest Artists. *He attended Acton County Grammar School along with The Who members, John Entwistle and Pete Townshend.